When we arrived in South America, we took a bus from the airport to the cruise ship docked in the terminal in Buenos Aires to begin our adventure. The port was certainly different from any one I’d ever been in on a previous cruise! It was a “working” port, filled with huge pieces of equipment and hundreds of cargo containers. The gigantic pieces of machinery moved the containers back and forth to load and unload from the cargo ships docked there. Princess Cruise passengers had to take a shuttle bus about a mile to and from the gate of the terminal to go into town or on shore excursions (and there weren’t any shops or restaurants just outside the gate like at many ports; it was strictly an industrial “work zone”). 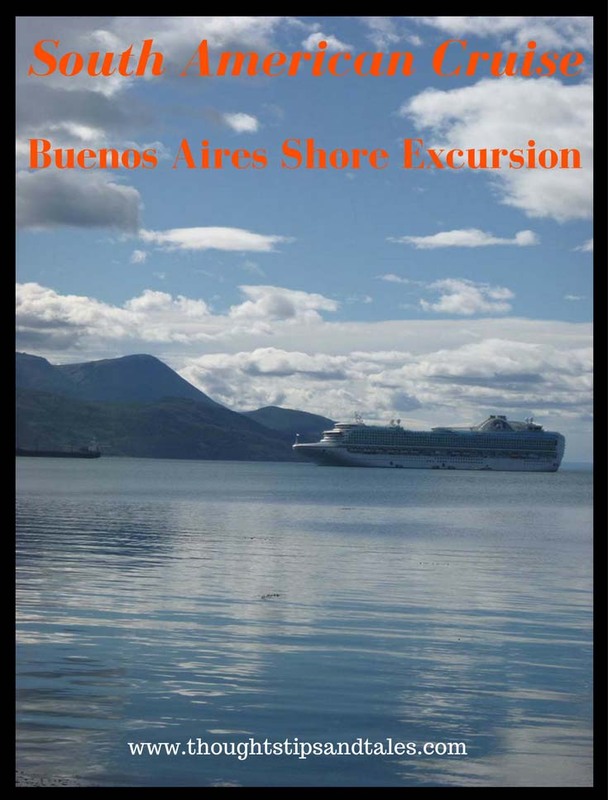 Again, unlike on previous cruises, the ship remain docked in Buenos Aires the first night and all of the following day, allowing a day and a half for local shore excursions. We were pretty beat from the long trip — and worked hard to stay up until after 9 so we could sleep through the night, then started fresh the following day. In the morning, we boarded a nice new tour bus for a 9-hour shore excursion and started off with a narrated drive through Palermo barrio (neighborhood), which was filled with parks, mansions and embassies. 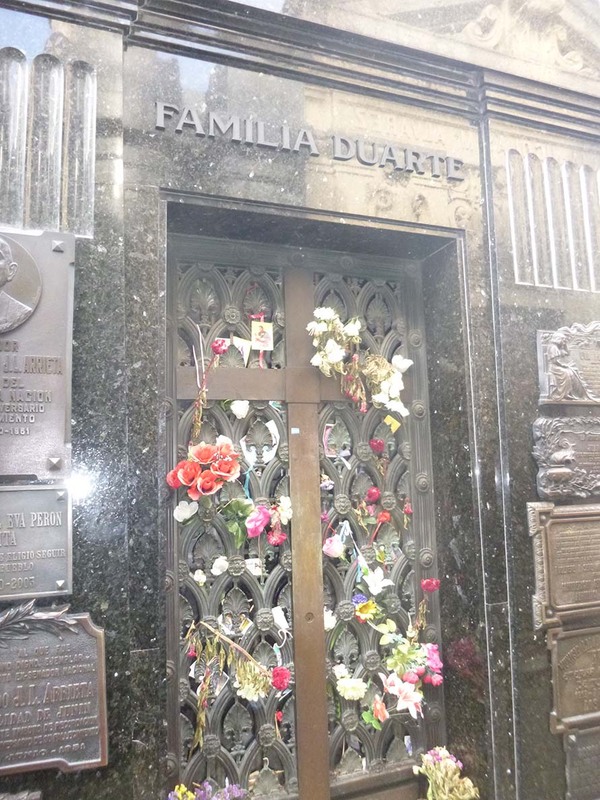 We got out in the La Recoleta district for a visit to the cemetery where Eva Peron was buried (below). Our lukewarm interest in a “cemetery stop” immediately changed to amazement and awe when we saw the gorgeous grounds filled with flowering trees and ornate mini-castle-like mausoleums built in a variety of architectural styles. The walkway was tiled, and the cemetery was laid out like a little New York City — overflowing with 6,400 unique, ornate, little buildings — each one more stunning than the one before! 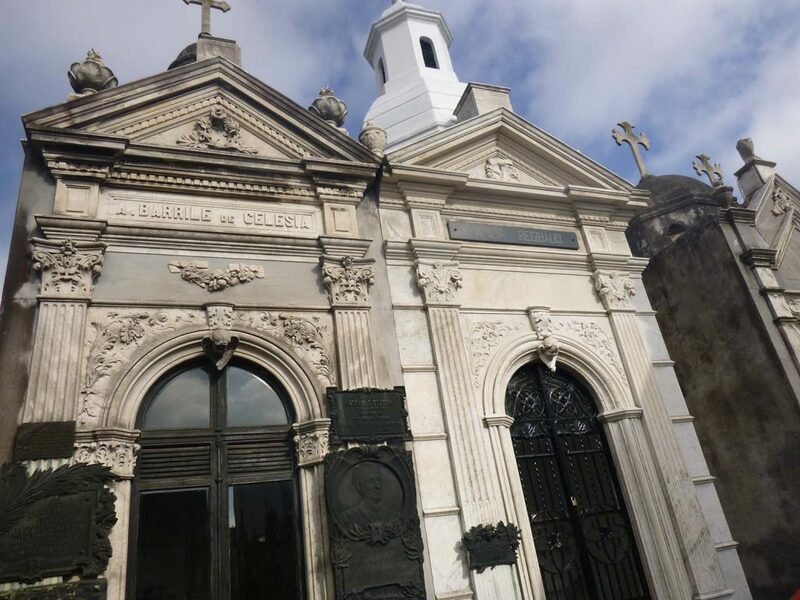 La Recoleta cemetery is a must-visit site if you go to Buenos Aires! For now, enter the name in a search engine, select “images” and prepare to be amazed! 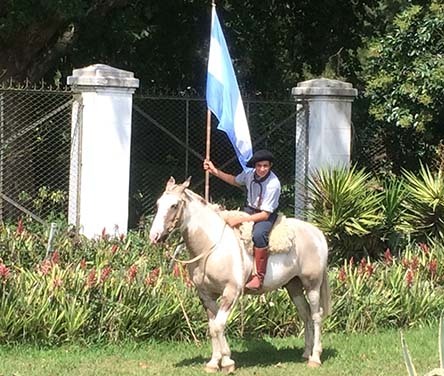 The bus took us next through rolling grasslands, known as the Pampas, for a journey to La Mimosa Estancia (ranch) where we were greeted with a man on a horse holding a flag and served appetizers in a beautiful garden. 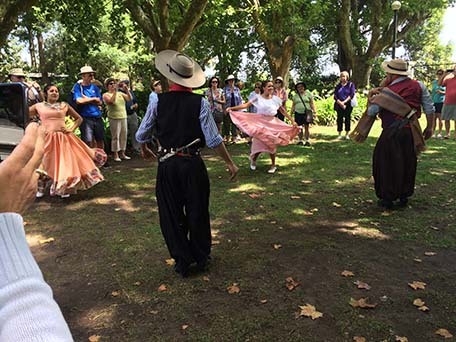 We enjoyed music and folk dancing by cowboys and farm women, displays of horsemanship and an Argentina asada — barbeque lunch — with many different cuts of beef. The gauchos were dressed in traditional flowing gaucho pants, serapes, vests and cowboy hats, and the women wore colorful, flowing dresses. The grounds of the ranch were filled with gorgeous flower gardens and contained roaming peacocks and stables of various animals. The whole day was definitely a one-of-a-kind experience! 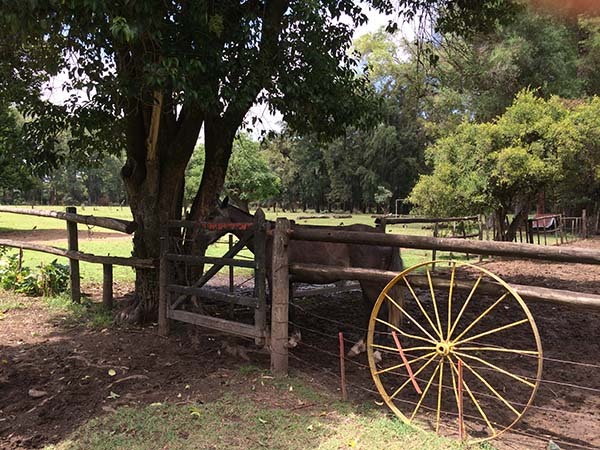 This entry was posted in Buenos Aires, South America cruise, travel and tagged Buenos Aires, Buenos Aires shore excursion, cruising, La Mimosa Estancia, princess cruise, South America, South America cruise, South America shore excursion, South American ranch, travel. Bookmark the permalink. That looks really beautiful. We had a speaker from Homewood Cemetery talk to us at the Frick Pittsburgh and her stories and information were fascinating. Who knew?